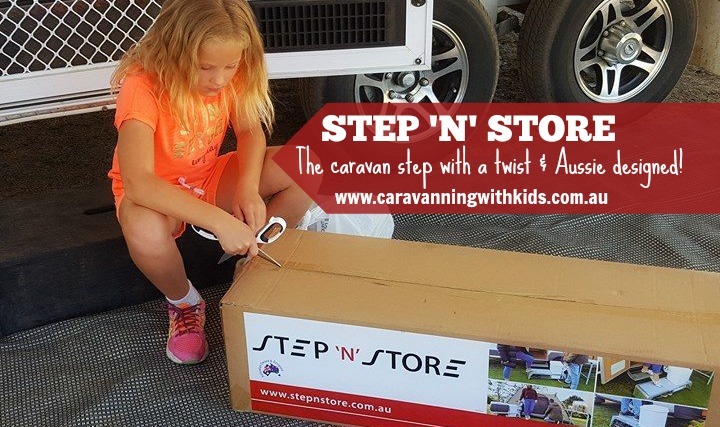 Step ‘n’ Store – the caravan step with a twist! 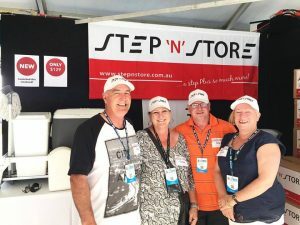 Last year at the Bendigo Caravan Show we met two of the loveliest couples you could ever meet! Deb & Pete…and Louise & Pete! 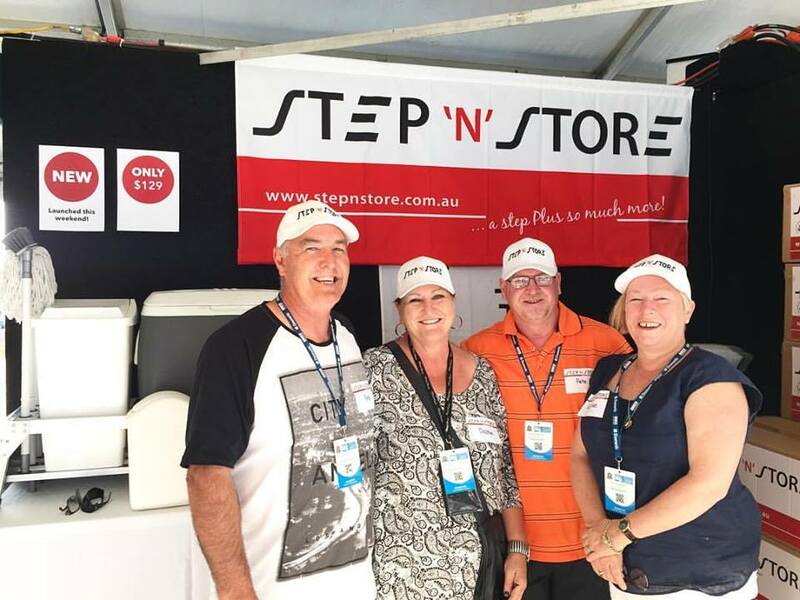 Inventors of the Step ‘n’ Store. A NEW innovative caravan/camper step that just blew us away. One of things I have never liked about our caravan is the step. It is heavy & awkward, so when I spotted the Step ‘n’ Store caravan step, I just knew that I needed one of these in my life. The more I looked and examined it and the more questions I asked about it, the more I fell in love with it. Couple all of this with the genuine and caring natures of the owners of this new business and I was SOLD! Now I just needed to convince Wayne! 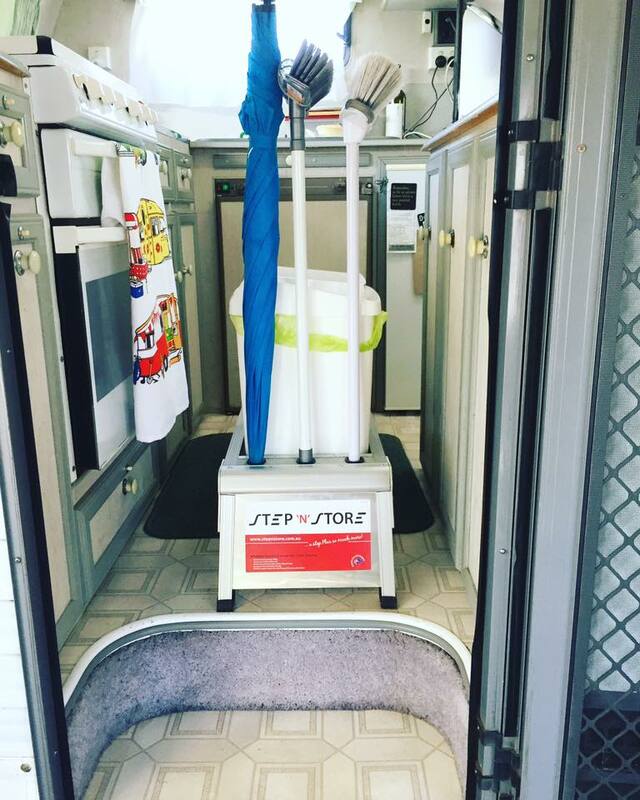 The caravan step was surprisingly very light, only weighing in at 6kgs which is significantly less than our current useless step and light enough for Ashlee to put in and out of the caravan. The hole for a rubbish bin is a winner! Like many families, we would keep our rubbish in an old plastic bag or collect it in a beer carton…eeeek, classy I know hahaha. Now having the rubbish bin, it is so much neater and the girls actually use the bin! Shoe rack – The amount of times we have had the girls crawl under the caravan looking for stray shoes or cold tootsies in the morning as their shoes are no where to be seen. Having a rack for them to put them away has made such a difference. We thought it would be a novelty, but they continue to put their shoes away which is fabulous! Everything having it’s place is lovely for us, especially on our longer adventures. Don’t get me wrong, we love making a mess and living in chaos and FUN is all part of the caravanning adventure. However, if we can keep some things in order, then it makes for easier pack up, clean up and getting off to see incredible things quickly. The Step ‘n’ Store does all this for us! We can honestly recommend this product as one that we have Tried, Tested and LOVED!. Gorgeous owners with a ripper Australian invention that is capturing caravanners and campers all over Australia. Head over to www.stepnstore.com.au to get yours today!! 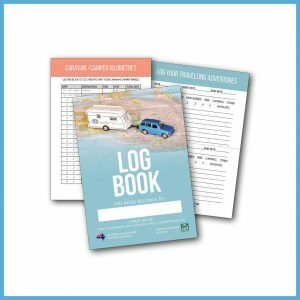 Have you seen our Australian Made Caravan/Camper Log Books and other goodies?? 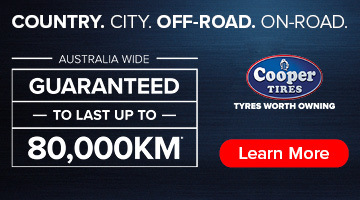 Head over to our shop to find out more..